When you are being carried along the road by nothing more than a cushion of pressured air, you want to be sure that air pressure is pretty much perfect. Too little air and your ride will be much tougher and you’ll be slogging along through treacle, too high and you’ll be bumped around uncomfortably, feeling every single pit in the road and each and every rock and stone. 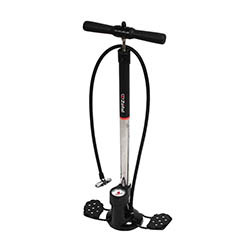 While a mini hand pump will get you home following a roadside emergency puncture repair, you’ll be needing a track pump to inflate your inner tubes to the pressure level needed. You should really be checking your tyre pressure before every ride – no more giving the tyre a quick squeeze and saying, “feels about right”. So let’s get right into it and take a look at some of our favourite track pumps right now. If you want to read a bit more about what elements you should be looking out for in track pump you can check these out at the bottom of the page. Robust and sturdy pump with a dual valve head and good, visible pressure gauge – all for around £30. This pump has a really solid and sturdy feel to it. It features a dual valve head, meaning that you don’t have to fiddle about switching nozzles if you are pumping up tyres with Presta or Schrader valves. The hose length is more than sufficient and the gauge is simple to read. At around £30 the price is very reasonable too. Padded handle coverings are kind to hands, mid-mounted 2-inch pressure gauge for easy readability. 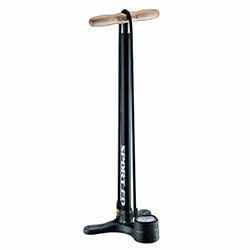 This pump from Beto features a tripod stand – because three legs are better than two – meaning it is extra stable. The handle is covered in a soft cushioning ensuring it’s kind to your hands and it can handle both Presta and Schrader valves. The only negative we found was that the clip to lock the valve head in place was very stiff and affixing it to the valve was a bit of a challenge initially. But at under £20 (at the time of reviewing), you can’t really complain. A bit more expensive than some of the other pumps we’ve featured, but with cast iron base and wooden handle it’s really solid and will last a long time. This pump is a bit more expensive than those featured thus far at around £60. But for your money you get a natural wood handle which is really comfortable to pump with, a cast iron base with folding feet and a steel barrel for easier pumping. This is a really heavy duty bit of kit. This pump can also reach higher pressures up to 230 psi – which is more than you will ever need. Good, solid all-round pump with a couple of nice features such as the clever auto-adjusting valve. Let down a little by a hard to read pressure dial. 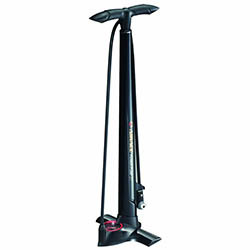 This floor pump from Airace has a couple of really nice features that we found helpful in testing. The first is the valve which automatically detects whether you are connecting to Presta or Schrader valves – so no fiddling with different fittings here, just attach without a second thought. The second is that the weight of the pump is concentrated toward the ground. It’s a fairly simple distinction but does seemingly make a difference, as the unit feels very steady indeed. The only negative we found on this pump is the pressure gauge which was a little tricky to read. If your eyesight isn’t great (which mine isn’t) you may find yourself bending down every couple of seconds to check where the needle is up to. Nice weighting means the pump is very sturdy. Quality construction from a trusted brand, with an extra-long hose and large pressure gauge for increased visibility. Valve issues reported by some users after use over an extended period of time. Lezyne are a well-known brand in the track pump space and this is a quality bit of kit. The handle is varnished wood which looks great and feels very comfortable under-hand and the feet, barrel and piston are all made from steel so you know they are going to last a good while. However the main selling points on this pump are the extra long hose (130cm if you are measuring) and the oversize pressure dial which is really simple to read without bending down. Although we didn’t experience any issues personally, we saw a couple of complaints from users that the valve popped after a year or so of use. I wouldn’t have thought that this would be a design defect and rather an occurrence that could happen on any floor pump, but it needed mentioning.